In 1843, before our present sanctuary was constructed, Methodists first met in a wooden building located at the south end of Chestnut Street, and moved in 1853 to a brick two-story building near the corner of Maple and Bridge Streets. Both of the buildings were built by Daniel Pratt. Church services were held upstairs, while stores were on the first floor. The sanctuary in the brick building could seat 700 people, and had frescos painted on the walls. In 1911 this site was transferred to the gin company, and the congregation voted to build on the corner of Fourth and Chestnut Streets. Groundbreaking for this church building took place May 4, 1912. In July, 1913, a cornerstone of Georgia marble was laid. In the copper box, placed inside are church literature, an 1850 Bible of Daniel Pratt, visiting cards and newspapers of the time. Inscribed on the stone is the sentence: "This Temple succeeds the one built and given by D. Pratt, 1883." The Alabama Christian Advocate of August 28, 1913, stated "Not only is it a pretty and inviting looking building when seen upon the outside from any direction, but within it reveals the latest developments of the church architect's art. The acoustics of the main auditorium are excellent, while the requirements of the modern Sunday School are well met in the rear." The balcony extended on three sides, and Sunday School classes met there. Tiffany-style leaded glass windows are original, although some panes have been replaced through the years. The tower has been struck by lightning several times. 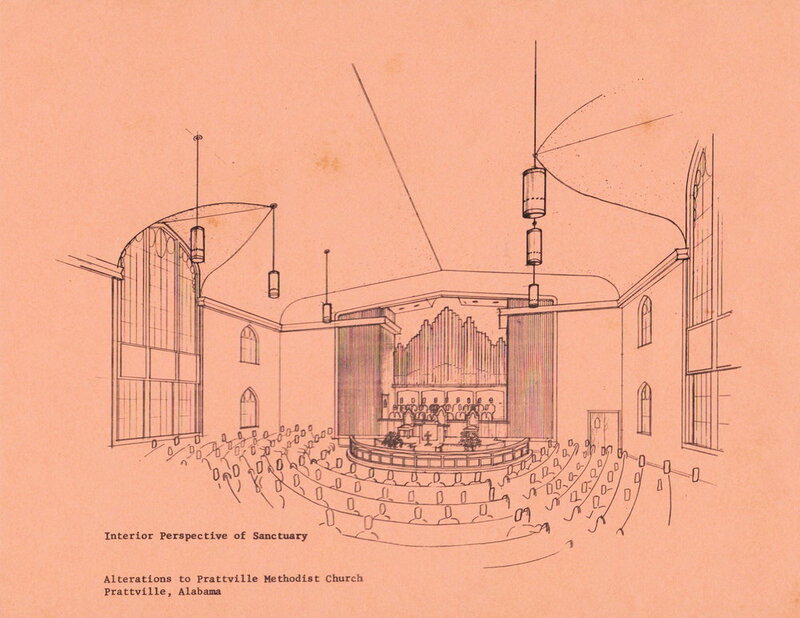 Until completion of the sanctuary, the congregation met in the courtroom of the county court house, paying for the lights and fuel used during worship. The first service in the new sanctuary was held Easter Sunday, April 6, 1913. In 1948, the building needed some face-lifting, and $10,000 was spent on painting and patching. A complete renovation was carried out in 1964, when the present balcony was constructed, the choir loft enlarged, and the covered walkway built. The Educational Building was added in 1957-58, with an open house heralding this new facility on Sunday, July 27, 1958. This building served as the worship center while the 1964 renovations to the sanctuary were completed. This facility has undergone several changes and in 2003 was renovated to include the Pastoral and Program staff offices. It was renamed Wesley Hall. In 1988, the congregation voted to begin a building program to add a much needed Family Life Center and to renovate portions of the church to accommodate rapid growth. At this time the Educational Building was remodeled, with the kitchen being moved into the new center. Dedication of the Family Life Center was held in September, 1989. This facility is now known as Pratt Hall. The Ross House and the Golson House, purchased in 1982 and 1987 respectively, were renovated in 1988 also, and in 1990 the Bell House was purchased and is now used by several Sunday School classes and The Samaritan Counseling Center. The youth made good use of the Ross and Golson houses for youth programs, projects and community service until they were no longer able to be used and were cleared away to make room for much needed parking. In 1996 the brick facade of the sanctuary building was cleaned and sealed, new carpet installed, and in 1997 a state-of-the-art heating and air-conditioning system was incorporated into this facility. In 2002 the Epworth Building was completed to be used for the Children and Youth Ministry as well as the Children's Weekday Ministries program which consists of a Mom's Day Out and a Pre-school. In 2005 the former offices located in the back of the sanctuary were opened up and made into a Music Suite. Our Choirs, Handbells and Orchestra use this area for rehearsals. The congregation continues to grow in number and in service to its members and to the community-at-large. Three morning worship services are provided, as well as an evening service. There are studies and activities in place on Sunday and Wednesday evenings for children, youth and adult.